Moira Gear is tired of being ignored. After years of begging to join her brother’s investigative firm, she’s off to seek her fortunes in the great tunnels of Water London. She’s needed there, even if no one else thinks so. Street children are disappearing, but only she appears to notice. That leaves just one option – save them and finally establish herself as a private investigator. Patrick Clock is THE investigator of the well heeled. Taking only the best cases, he’s earned quite the laudable reputation among both the municipal force and common citizens. He wants nothing other than to focus on his work, but while out on a call, he spies a woman with a remarkable eye and a talent for trouble. What choice does he have but to follow her? Their plans don’t involve each other, but Patrick and Moira find themselves tangled in a web of danger and lies. As their temporary partnership tumbles dangerously close to love, they must each find the courage to save the waters of London and each other. 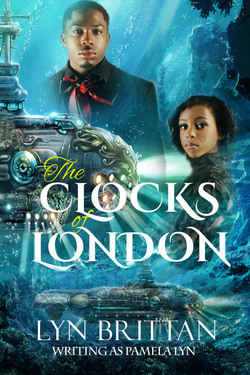 Kennerick Clock, London’s most ornery private investigator, has just received a note from the woman who broke his heart. Lady Hala Javan needs his help and he’s willing to give it - for the right price. But if Hala thinks a curiously folded piece of paper can reel back him in, the spoiled brat better think again. Lady Hala feels about as small as a sea flea for writing Kennerick. Untitled and of common employ, she abandoned him years ago under pressure from her family. Leaving him remains her deepest regret. Now facing an attack on her life, she needs Kennerick. He’s the one man strong and clever enough to save the day. Assuming, of course, he doesn’t kill her first.